Where do you live? Elgin, Illinois. How long have you lived there? 30 years. I didn’t grow up here – I’m just old. Are you married? Yes, married for 20 years. Kids? Yes, we have 2 adopted children. My daughter is 12 and my son is 8. Full time job? Yes, just started a new daytime office job. I also do Uber driving on the weekends. Education? I have a B.A. in Communications & Fine Arts from Judson University. They didn’t have a creative writing degree when I attended, but I studied theatre acting and directing, and I learned a lot of writing techniques from acting. They both involve creating full characters and portraying an imaginary scenario in such a way that the audience feels like it’s really happening. Who is your favorite author and book? My favorite author is Ian Fleming, and my favorite book is Moonraker. If you’ve never read the original James Bond novels, that probably sounds pretty juvenile. But Fleming was a genius at creating suspense, along with exciting scenarios and enthralling villains, similar to the way Raymond Chandler did it with his detective stories. I also love J.K. Rowling, and I want to read more of James Rollins, whose writing is very similar to mine. And I love some classic works of H.G. Wells, Edgar Allen Poe, and others. I think every writer should study some classic works of their genre as a foundation, to know what made those stories last and try to duplicate those elements. What is your preferred genre? I write action thrillers that read like blockbuster movies. I’m all about action, like the kind you would see in a James Bond or Indiana Jones movie. I pack a lot of action into my stories. I also write suspense and fantasy, similar to the stories you would see on The Twilight Zone or Doctor Who. How did you start this journey to become a writer? My second grade teacher encouraged me in it, and by middle school I had decided I wanted to be a writer. I learned a lot of my technique from studying acting, and from being a Drama Director for nine years at my church. I worked alongside my pastor to create weekly dramas to help illustrate his sermons. Most of them were really good, some were outstanding, and some were just done. I learned to produce something of quality on a regular basis, instead of waiting for the perfect idea to come along. I also learned that a novel is just a series of intriguing scenes, like my 10-minute dramas, put together until they form a complete overall story, and each scene needs to matter and be satisfying to the reader. What have you written so far? 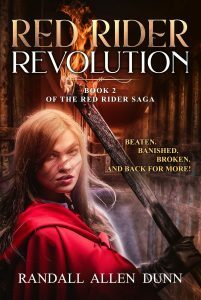 I have written The Red Rider, about a 16-year old Red Riding Hood fighting werewolves, and its sequel, Red Rider Revolution. I also wrote an intense action thriller called Den, about a college girl who has to fight her way past ten Stalkers trying to capture her in an abandoned theme park. And I’ve written a family-friendly Indiana Jones-style action adventure set in World War I Africa. I’ve also written a book for writers about how to create story humor, and I recently revamped some short stories that I’m releasing, 2 at a time, for a 2 Tales series. Tell us about your current book. Red Rider Revolution continues the story of Helena Basque, a teenage girl who was attacked in childhood by a large wolf that marred her face with triple scars. In the first book, The Red Rider, she dons a red hooded cloak like the one she was forbidden to wear in childhood, and arms herself with a repeating crossbow and other weapons to hunt and destroy the wolves on her own. In the sequel, she discovers a new order of wolves that is deadlier and more cunning than the first. But as she tries to fight them, the people of her province that she once saved now wonder if she’s gone mad with grief, as her stories of the wolves seem less and less believable. She ends up having to not only fight to save them, but also to save herself and prove her sanity. What is the inspiration for your current book? The first book. (heh heh). The idea for the Red Rider came from two main sources: the Red Riding Hood movie, in which the big bad wolf was a werewolf, and the TV series, Once Upon a Time, that transformed Snow White into a Robin Hood-style outlaw in the woods. Beyond that, I had several influences. Helena Basque – the Red Rider – is a combination of Buffy the Vampire Slayer and Batman. And her battle with the Lycanthru, the cult members who transform themselves into wolves, is largely patterned after the bullying from The Karate Kid, while her neighboring community is inspired by Little House on the Prairie. This second book deals a lot with becoming an outcast by doing what’s right when no one else will, like the first one did. Except that this one starts with Helena finding a place of acceptance and peace for the first time in her life, before it’s all ripped away. Who was your favorite character to write and why? There are several intriguing characters, good and bad, and of course, I love writing Helena. But I really loved writing Frayne and Lisette Leóne. They’re the parents of Helena’s boyfriend, Pierre. Frayne doesn’t want Helena hanging around their house because he feels her war with the wolves only brings trouble. Meanwhile, Lisette takes on a motherly role to encourage Helena, showing her unconditional love and acceptance. It creates a lot of tense moments in otherwise peaceful scenes, like a Thanksgiving dinner with awesome food eaten with several people you don’t trust. Is there anything of you in that character? Yes and no. I have a temper and it can turn me unreasonable like Frayne, until my wife directs me to a better way of handling things. I’m also like Lisette in the way I love to encourage people and accept them. What surprised me in writing this series is Helena. Every character has some aspect of me in them, my faults or positive traits or both. Helena is like me in the sense of wanting to take action to do something with no regard to whether people approve of it. But I was shocked when she started taking really violent measures – necessary, but violent – in the first book. I thought, “Oh, wow, am I really that ruthless inside?” But I realized that, if a bunch of werewolves were threatening to devour my family and friends and everyone I knew, maybe I would be kind of brutal like Helena, too. Thankfully, that has not happened to me so far. What sets your book apart? 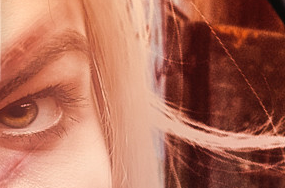 Helena’s character. I mentioned that she’s like a combination of Batman and Buffy. She puts on a front that terrifies her wolf enemies, like Batman does, and she is extremely tough. But inside she’s still a teenage girl, and even more fragile than Buffy, because she’s lived her entire life feeling ugly and isolated. That fragile nature behind the veil of deadly force makes her an intriguing character. This also fits with the concept of a fairy tale retelling, because Red Riding Hood is the most famous victim in literature. She’s a helpless and naïve girl who wanders off the path on a dangerous journey to her grandmother’s house, then talks to a wolf as if that’s normal, and reveals all her plans to him, only to set herself and her grandmother up for attack. In this series, we see an older Red Riding Hood who’s still a girl, learning to fight back against the wolves that once terrorized her. I think that idea of standing up to face fears and bullies, to do what’s right no matter what, is what makes the series so appealing. Okay, here’s an excerpt, slightly edited to remove any genuine spoilers. The crowd erupted with a deafening roar of approval, growling, stamping their feet in the seats, scratching at the walls. I surveyed the room, filled with my deadliest enemies, ready to tear me to ribbons. “Ready, dear?” my tormentor asked, her voice shrill in my other ear, as the ropes were slashed and pulled off my arms. I massaged my wrists, glancing back at her. “Better? You’ll want your limbs free to run, I assume,” she mocked, backing away to the outer entrance, where thick doors were shut behind her. I stared at the surrounding wolves again. The Lycanthru who had taken everything from me, and planned destroy everyone I knew and loved. As I studied each wild face, Francois Revelier’s advice surged in my memory: Stand up and do something. I never thought I could stand up to Jacque Denue and his gang. Let alone take on the entire Lycanthru cult that terrorized La Rue Sauvage. But I did it. By the grace of God and sheer determination, I did it. “Then let the games begin!” the leader shouted, before stepping away to the outer walls to make room for the attacking wolves. Garroche snapped the whip again, urging more slaves to the center of the Arena. The other prisoners scrambled forward and crouched like I did, though surely not for the same reasons. They probably hoped to run, to minimize their pain. Not to escape, and certainly not to fight. I had no idea how I would fight the Lycanthru without weapons. But Francois taught me to use an enemy’s strength and actions against them. With my hands and legs free, I had a chance, slim as it was. The closest wolves dropped to all fours, ready to spring. I crouched lower, my skin tingling. Partly from fear, I knew, but also from something else. I was moving beyond fear now, as I stared into the leering faces of the monsters advancing on us. The same breed of wolves who killed Grand’Mere Marie and tore my face open when I was only seven. The same wolves who killed my greatest friend, Francois, and proceeded to slaughter Papa, Mama, and Suzette. Who tried to kill me a dozen times before convincing everyone I was crazy and locking me away. The asylum struck terror into my heart last night, as it must still do to the other inmates. Terror over the helplessness they felt, wondering what the Lycanthru would do to them. But I wasn’t helpless anymore. Not for several months now. What more did they think they could do to me? I spent most of my life in misery. And for the past few months – with Pierre and with Father Vestille – I was happy. Truly happy. Now they had taken all of that away, as a cruel revenge. I no longer felt fear. I felt rage. In the next sixty seconds, all the fear in the room would be theirs. They wanted to capture the Red Rider. They would no longer enjoy it. What was the most difficult part to write? When some writers hear this question, it’s about what was emotionally stressful for them to put down on paper. I really don’t experience that. I’m very emotional in my writing and I let all of it flow out, so the parts that are difficult for me to write always have to do with the mechanics: trying to condense a scene or combine two scenes into one to make it work. One of those decisions involved action scenes. I have two action scenes that take place in a tavern, fighting wolves in close combat. What’s worse, they’re the first two big action scenes of the novel! So I planned to cut the second one to avoid redundancy. But in the end, it was too good to let go, so I kept them both. What was your favorite book to write? I always have a blast with whatever I’m writing, which every writer should. I tell people that writing is like reading your favorite story, except that you get to control it. I love all my stories because I’m writing exactly the kind of stories I would love to read, and I trust that every writer does the same thing, for the most part. That being said, the first Red Rider book was my favorite story to write. Everything flowed easily as I was writing and I got to create a legendary hero, like Zorro or Robin Hood, which is something I’ve always loved but never thought I would be clever enough or blessed enough to get to write. How do you write? Do you have a set time or place? How many hours a day? I wish I did, but right now I don’t. I’ve had to focus on several other things for many years to help pay bills. But things look like they’ll stabilize enough for me to set up a regular writing schedule. Right now, I write for about 15 minutes on my lunch break and whenever I can snag some time sitting on our living room recliner with my laptop. I keep a schedule of my word count for whatever I write and aim for a weekly goal of 3000 words, which isn’t much, but it’s what I can do for now. And sadly, I frequently can’t hit that goal. By this time next year, I hope to completely change that. Why did you want to be a writer? Since I’m going to be writing all these stories, anyway, I might as well make some money from it. And since I write the kind of stories that people love to see in popular movies, I hope to make a living from it eventually. I also want to show people hope. I grew up on comic book superheroes, and I think the reason superhero movies have become so popular is that the screenwriters finally figured out that it’s not about capes and masks and special powers, but about people making extraordinary sacrifices in order to become heroes. The original Spider-Man movie portrays this perfectly, showing that although Peter Parker started as an awkward kid, he was able to choose to become a hero. Not because he had superpowers, because his initial plans were to make money from it as a masked wrestler. But after he let a criminal escape who then murdered his uncle, he realized the long-term impact of his actions. He changed his mindset to think about serving and rescuing others, even though it cost him his reputation and ultimately forced him to sacrifice the love of his life to keep her safe. The theme of his story is the theme that makes superheroes stand out as role models for the kind of people we can all become: With great power comes great responsibility. How do you get your ideas? My problem is how to stop getting ideas. I could come up with a new story idea every single day if my schedule allowed it. But usually I get an idea from something that strikes me as an interesting aspect of human behavior, that I express through some kind of action scenario or fantasy story. I got the idea for my action thriller, Den, from a tragic news story about a girl who was dating a guy that was into online gaming, like she was. But he turned out to be a stalker she couldn’t get rid of, and he eventually killed her. It was really sad and horrible. But I had an idea, about a villain who made a girl into a game. So in Den, a frightening college genius who’s obsessed with this girl sets her up to play a live game where she has to fight to escape, and she has no choice but to play along. What do you have planned next? I’ll continue to write the Red Rider series, and sequels to my other current books. I’m also publishing a new middle grade fantasy called The Island of Myste, about an adopted girl who gets trapped in another world with her parents, where she discovers that she must rescue a bunch of mythological creatures are imprisoned on an island. It’s an exciting adventure for families that deals with feelings of abandonment and self-worth and faith, like Narnia meets Percy Jackson.